Program #NADR007. Recorded in Los Angeles, CA on August 20, 1996. 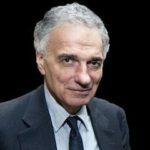 This exclusive interview with Ralph Nader covers a wide range of issues that offer insight into the thinking of the man Life magazine has ranked among this century’s 100 most influential Americans. Nader talks about the current political scene, the environment, media and his childhood hero, Lou Gehrig. The Citizen Nader interview is an excellent companion to his speech “Beyond Politics as Usual”.